As 2018 comes to a close, let us take a moment to reflect on a year of local energy progress. Municipal and community solar projects have continued to accelerate across the state, with 2018 alone boasting new projects in Bow, Claremont, Derry, Dover, Hollis, Keene, Laconia, Lebanon, Newport, Plymouth, at Philips Exeter Academy, and in many other communities. Energy efficiency policy under the state's new Energy Efficiency Resource Standard continues to expand and improve NHSaves program offerings for all. This year, New Hampshire launched a new and highly successful program to help deliver the benefits of solar to low income communities. Communities across the state organized the most robust series of Electric Vehicle Expos yet, helping to educate thousands about the growing opportunity of EVs (not to mention weatherize, solarize, and 100% Renewable Energy!). And at least one New Hampshire utility aims to lead the nation by embracing energy storage and regulatory innovation. Throughout it all, Energy Committees continue to sprout up from Fitzwilliam, to Loudon, to Exeter, and beyond. It has been a strong year for Local Energy Solutions, some might say the strongest yet. And its thanks to you - the local energy champions of the Granite State. Happy Holidays, we'll see you in 2019. Concord, NH – The first snow storm of the year may as well have been confetti for the 2018 Local Energy Solutions (LES) Conference, held November 16th at the solar-powered Grappone Conference Center. The conference kindled new ideas and solutions for New Hampshire’s energy future, attracting a crowd of over 310 registrants, 250 of which refused to be daunted by the snow. Focusing on the communities, businesses, and policymakers that drive change and success, the event highlighted energy storage, microgrids, efficiency, electric vehicles, and beyond as opportunities to address the Granite State’s energy challenges. Read more here. The Liberty-led pilot will be the second regulator approved program for utility-owned behind-the-meter storage, and phase 2 will be the first to include the private sector. Read more here. The Town of Bedford has issued a Request for Proposals for the land lease of town-owned locations for solar photovoltaic projects. The link to the RFP is: https://www.bedfordnh.org/DocumentCenter/View/3453/RFP-19-2018---Land-Lease-of-Town-Owned-Locations-for-Solar-Photovoltaic-Projects. The RFP submission deadline is December 19, 2018. Three community teams launch Weatherize campaigns this January. If you live in one of the participating towns, join us at a kick-off event to learn what Weatherize offers, meet your partner contractors, and find out what you can do to save money and stay warm this winter. Weatherize Mount Washington Valley Kick-off: Saturday, January 19, 9:30 - 11 am, at the Tin Mountain Conservation Center in Albany, NH. Participating Towns: Jackson, Bartlett, Albany, Conway, Eaton, Madison, Freedom, Tamworth, Chatham, and Harts Location. Weatherize Canaan and Enfield Kick-off: Saturday, January 19, 3 - 4:30 pm at the Mascoma Regional High School in Canaan, NH. Participating towns: Canaan and Enfield. Weatherize Kearsarge Kick-off: Saturday, January 26, 2 - 3:30 pm at the Kearsarge Community Presbyterian Church in New London, NH. Participating towns: Andover, New London, Newbury, Sutton, Warner, and Wilmot. 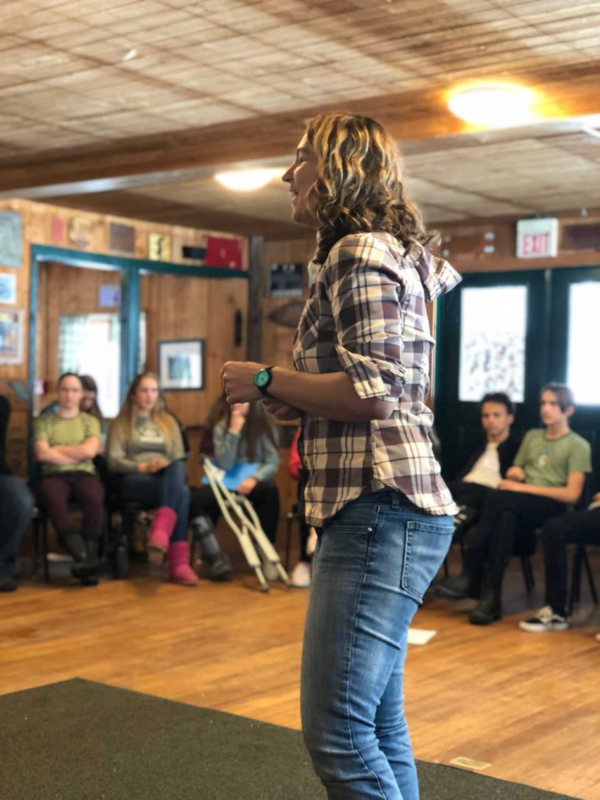 Nearly 100 teenagers from across New Hampshire and Vermont convened in Fairlee, Vermont, Nov 15-16th for the 3rd annual Youth Climate Leader Academy, organized by the Vermont Energy Education Program (VEEP) and New Hampshire Energy Education Project (NHEEP). These inspired teenagers were united by a common goal, to develop a project within their school communities to help combat global climate change. At the retreat, students attended workshops on environmental activism, social movements, graphic design and marketing to learn valuable skills to assist with their project. “It was great because there was a community of people who were all motivated by a similar goal: to have a more sustainable planet. It’s great to know that other kids our age are interested in this, which motivates me even more,” said Allison Howland (‘22). Read more about the event in this article from Oyster River's student magazine, the Mouth of the River. The US Department of Agriculture has announced its 2019 Wood Innovations Grant Program. This year grant funds can be used for design engineering as well as construction of community-scale (e.g. schools, municipal buildings, public works facilities, hospitals) modern wood heating plants. Grants of up to $250,000 are available, and require match funding. A total of $8 million is available for the national competitive grant opportunity. Application deadline is January 23, 2019. More information HERE. In the past several wood chip boiler installations in NH have successfully competed for funds through this program. The Rindge Energy Commission partnered with the Fitzwilliam Energy Committee, the Rindge Ingalls Memorial Library, the Fitzwilliam Library and ECHO Action to host a NHSAVES Button Up Workshop at the Rindge Recreation Building on Tuesday, Nov 27th from 6:30 to 8:30. Eighteen people from 4 towns showed up to get tips on energy efficiency and weatherization for Do-It-Yourself projects as well as information on how to access NHSAVES programs for homes that qualify. Many thanks to presenter, Ted Stiles, of Yankee Thermal Imaging, and to Robbin Adams of PAREI for sponsoring the event. MILFORD — Voters will decide in March whether to lease about 120 acres of town land for the construction of a large solar farm. The Board of Selectmen has signed a letter of intent with Granite Apollo, a solar energy company in Manchester, to develop a solar project up to 20 megawatts on the former Brox industrial property. Read more here. On November 28th the Keene Municipal Services, Facilities, and Infrastructure Committee voted 4-1 to send the 100% Renewable Energy resolution to city staff to draft more formal language. Once rewritten, the resolution will make a return visit to the committee for passage before being sent to the full City Council for a vote. The goals set are for all electricity from renewable sources by 2030 for the entire city and its residents. By 2050 the goal is to have all energy used in the city to come from renewable sources. 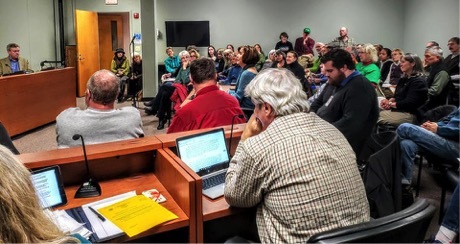 This night was special because of the number of Keene residents and nearby townspeople in attendance AND representatives from the Monadnock Energy Hub (MEH). Steering Committee members Dori Drachman, John Kondos, Ann Shedd, and Peter Wotowiec all stepped up to make their voices heard on this important resolution. Ann, leader of the Keene Energy & Climate Committee began with an example of a resiliency program from Sterling, MA Keene could model and more, John followed with an impassioned plea that we must act now, Dori stated that surrounding towns such as her hometown of Peterborough look to Keene on such actions, and finally Peter ended by reading a letter of support from his employer, Bensonwood, for this resolution. Mary Ewell, program coordinator for MEH, didn’t want the council to forget the power of future generations to problem solve and apply, as yet unimagined, technological advances as the goals set are 10 and 30 years in the future. Many more citizens and members of local energy committees spoke during the evening and the MEH steering committee and program coordinator were proud to have added their voices to such company. MEH plans to attend the next MSFI committee hearing when the revised language resolution is discussed and hopes to celebrate the final passage in the near future. We are at the front end of a major evolutionary change in how energy systems interact. Instead of individual systems—buildings, utilities, the transportation sector, and the industry sector—it’s becoming one system, and buildings are going to play a central role in that new paradigm. Buildings will be where energy is generated, stored, and commandeered, and we will be optimizing energy flow in a different way. In keeping with this year's "become aware, get engaged, and start now" effort, ASHRAE will be hosting this month's program event on Microgrids. This presentation will focus on what microgrids are, and examples of how this emerging technology can enable a more energy independent, secure, and resilient strategy for how we power our buildings, homes, and communities. Speaker Bio: Alexander Tang, a Project Manager at TRC’s Advance Energy Group, has a diverse set of experience with over seven years of experience, in both engineering and business, focusing on building design, renewable energy, and sustainability. He has worked on DER projects developing microgrid financial and business models, microgrid system engineering and Energy Storage System (ESS) projects in the North East. Additionally he has testified at the NH House of Representative for HB 1338 regarding the establishment of a committee to study policy changes needed for Microgrids in NH and presented at ACEEE Summer Study on microgrid business models. Tang is a certified EIT, LEED AP, and is a graduate of Tufts University in Electrical Engineering and has an MBA from Boston University. When: Friday, December 21st, 9:00-11:30am – open to all! All those interested in alternative fuels and advanced technology vehicles are welcome to attend the next GSCCC Stakeholder Meeting on Friday, December 21st from 9 – 11:30 AM. We will be meeting at the New Hampshire Department of Environmental Services Coastal Offices at Pease International Tradeport in Portsmouth (click on the link above for directions and details). On the agenda, Steve Pesci, Special Projects Director in the Campus Planning Office at the University of New Hampshire (UNH), will be presenting on the Electric Vehicle Infrastructure Plan that UNH adopted; James Penfold, Co-Founder of EV LaunchPad will be giving a Show & Tell/Q&A on selecting the right types of charging stations and features for each public application, including DC fast charging and Ron Currier from Hilltop Chevy in Somersworth will be bringing a Chevy Bolt for test drives. RSVP: Please RSVP if you are interested in attending: Jessica.Wilcox@des.nh.gov or (603)271-6751. NHEEP is recruiting a part-time regional Energy Educator to deliver in-class student workshops to schools in central and southern New Hampshire. View job description here. About Our E-Newsletter: The monthly Local Energy Solutions E-newsletter is compiled and distributed by the Clean Energy NH on behalf of the LES Work Group. Learn more about Clean Energy NH.